The following examples show setting up and using three different move sets that use Maximum Days at Location with Auto Move Set processing enabled (do this on the Media Defaults panel). 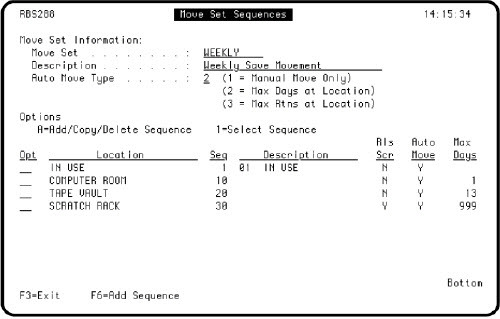 You need to define storage locations for the volume movement before creating a move set. The sum of the maximum number of days in each location (except the scratch pool location) should be equal to or greater than the actual number of days before the media expires. Create the locations for the move sets. From the Robot Save Main Menu, select option 7, System Setup Menu. 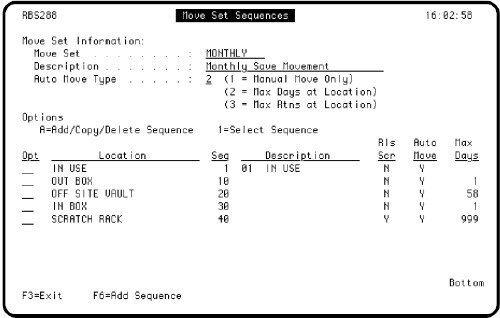 Then, on the System Setup Menu, select option 5, Storage Location Entry. 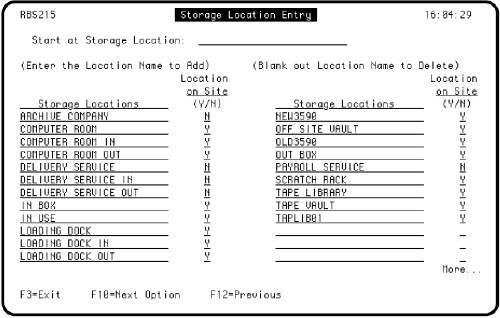 When the Storage Location Entry panel displays, enter the name of each location you want to create on a blank line. When you press Enter, the names are sorted in alphabetical order. The Scratch location must be on-site to allow your volumes to be released to the scratch pool. Do not define an AML location using the Storage Location Entry panel. An AML location is defined when the AML is defined to Robot Save and does not display on this panel. Define the move sets you want to use for your backups. Each move set describes the sequence of locations used by the backup set volumes. From the System Setup Menu, select option 7, Move Set Maintenance. Press F6 to define each new move set. Note: You also can move the volumes back on-site after they have expired. You can find additional information on creating and using move sets in the Robot Save User Guid.